So often with landscape painting it is those less significant features that trip us up – that clump of grass in the foreground, or awkward blob of a hill in the background. Dealing with these is often best accomplished by reducing the item to a mere suggestion or hint to reduce their impact. This aspect of painting was recently brought to my attention by one of my blog-readers who was having trouble with river banks and reflections. The painting I have chosen to illustrate this problem varies considerably from the photograph of Ian’s subject, but does hopefully answer some of the points raised. Where the farther left-hand bank abuts the sparkling part of the stream I have painted mainly yellow ochre, but dropping in some light green and red in places while the paint was still wet. When this area had dried I then modelled the sloping bank by working in the darker hollows with a mixture of something like cobalt blue and raw umber, softening off the darkness of the wash so that it left the original yellow ochre parts light at the top curve of the bank where it catches the light. Notice the closer left-hand bank is darker, and this helps suggest depth. It’s fine to have part of the bank dark, caused by shadow, but best not to have the whole line of the bank in the same dark tone. You don’t have to paint it exactly as it appears, so introduce some lighter spots and stamp your own creativity on the work. With the field beyond the bank, keep this as a simple wash similar to that on the left side. If there are light or dark lines along the bottom of the bank where it meets the water then make this effect intermittent as it can intrude if taken all the way along the river. The reflections in this scene were mirror-sharp in the placid foreground pool, but I wanted them to be less prominent and rendered them using the wet-in-wet method, dropping in dark reflections and then pulling out the light ones with a damp brush, but that is best left for a separate blog in the future. I used Saunders Waterford NOT paper for this watercolour. Water is a devilishly difficult subject to paint, but when you get it right it really does make the painting sing! 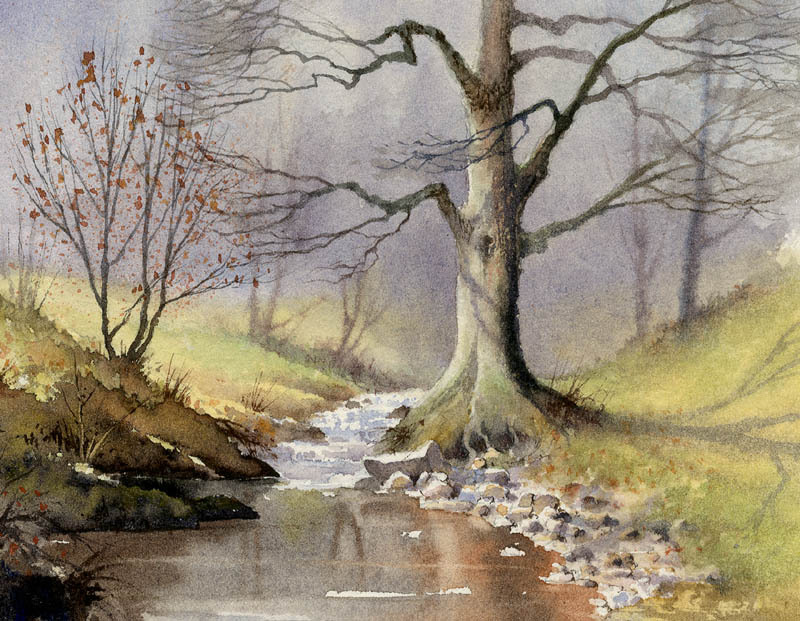 This entry was posted in aerial recession in landscape paintings, David Bellamy, Water in watercolour and tagged painting water, water in watercolour, watercolour by David Bellamy. Bookmark the permalink. very nice painting, wish I could paint like that. This is really a helpful lesson! It happens so often that some little thing in a scene can really trip up the whole painting if given too much attention. Thanks for this good example and and solid solution.